Every season with holidays is guest season, so don't expect much of a reprieve year round. Spring has St. Patrick's Day (which isn't done right without overnight guests) and Easter. Summer is full of vacationers, not to mention both Memorial Day and Labor Day parties. Autumn has Thanksgiving, which requires enough space for guests to suffer through their individual food comas. Winter gives us Christmas and a lot of bored college students lounging around the home for a month. Guest bathrooms are a necessity - there's no getting around it. While a spare couch or sleeper sofa can make an adequate bed, your guests will need a spot to clean up and refresh in comfort. So when it comes to the guest bathroom, what essentials do you need? Besides the fixtures, everything necessary is going to be in the linen cabinet. Consider these. 1. Extra toilet paper. While it's not world-crushing, it can be awkward for a guest to ask a host for a few extra rolls of TP. Save them the trouble and double-check that your linen cabinet is packed with three extra rolls at all times. 2. A spare loofah or two. If asking for toilet paper is uncomfortable, asking to borrow a loofah is downright terrifying. Your guest will likely agonize for hours over pronunciation before biting the bullet. Hang a few from stylish hooks on the inside of the cabinet door to save them that trouble. 3. Advil and Tylenol. You can go with the generic ibuprofen or acetaminophen as well, but keep in mind that some people have personal preferences for one or the other. 4. Hotel-sized bars of soap. This might seem overly indulgent toward your guests, but providing individual-sized bars of soap can be a nice gesture. Some people simply hate sharing bars, and when they forget their own, it's always nice to have a spare handy. 5. Toothpaste. Think of the number of toothpaste tubes you have bought when traveling and then weren't able to bring home with you. Just keep your cabinet well-stocked with it, alongside dental floss, mouthwash and especially a spare toothbrush or two. 6. Linens. Shocking as it may be, these are essential parts of a linen cabinet. 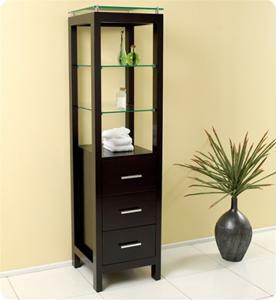 Devote one of your shelves to towels, and consider keeping a stack of hand and face towels as well. Of course, it doesn't hurt to hang a few from a towel bar as well, adding a little color.